Private J. R. Kealoha, a Native Hawaiian soldier is a true hero of Hawai`i for his bravery and willingness to sacrifice his life for a war that was not his own and for a country that he knew little about. It took a long 150 years for this noble son to finally receive the honor he so well deserved for his military service to the United States of America during the Civil War. 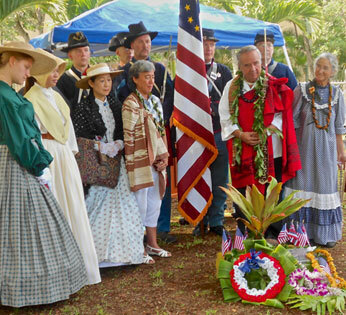 On October 25, 2014, a simple granite gravestone marker was ceremonially unveiled, dedicated in his honor by Hawaiian minister Kahu Silva, and placed on his unmarked burial site in the historic O`ahu Cemetery. 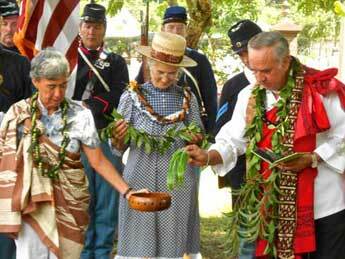 Historian Nanette Napoleon of the Hawai`i Sons of the Civil War Memorial who spearheaded the dedication, spoke about the dozens of Hawaiian soldiers and their contributions to the Civil War that are forgotten. All of them are heroes. In ancient Hawai`i, demonstrating unselfish courage in battle was considered one of the greatest ho`okupu (gift offerings) of aloha that a warrior could give to his fellow man. 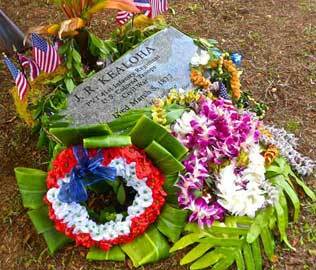 This unconditional sharing of his “spirit of aloha” on behalf of others is the proud and admirable legacy that Private J. R. Kealoha leaves in his memory as a native son of Hawai`i. E ola Koa! 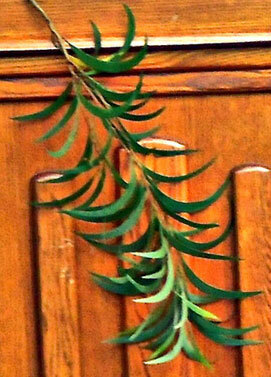 May Private J. R. Kealoha’s memory live long in the hearts of the people like the koa tree that adorns the upland forests of Hawai’i.